THERE ARE SO MANY INCREDIBLE THINGS TO DO IN VILNIUS, LITHUANIA. IN THIS POST, I WALK YOU THROUGH MY FAVOURITES. I’ve made it absolutely no secret that I fell hard for Vilnius during my short visit in April with the folks at Travel Addicts Club. Like, a borderline restraining order kind of love. Naturally, this obsession is linked to all the many, many awesome things to do in Vilnius. My three day break whizzed by like nothing, leaving me with intense withdrawal symptoms from the hearty comfort food, the beautiful churches and of course, the endless parade of perfect cafes. Eager to see what I mean? 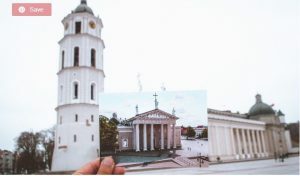 If you’re wondering what to do in Vilnius, here’s a list for you, from sightseeing and attractions to activities a bit more off-the-beaten-path. 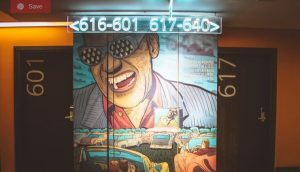 Where to stay in Vilnius: We stayed at the Comfort Hotel Rock and Roll, and it was perfect! Awesome decor, really friendly staff, comfortable beds and a nice location just outside of Old Town. If it’s beautiful sights and cool attractions you’re after, lucky you. Vilnius has them in abundance. Here are some things to do in Vilnius on the attractions/sightseeing side. Enjoy! I love walking tours for a simple reason: they bring a place to life. You can be in the most beautiful city, looking at the most stunning architecture and buildings, but without historical context and local stories to bring them to life, you miss out on a huge chunk of what makes travel so magical. Especially in a city like Vilnius, with such an interesting history, exploring with a guide is a must. We luckily had our friends from Travel Addicts Club with us during our stay, so we got to learn not just what sights we were drooling over, but also some personal stories and context that brought them to life. If you want the same experience, these guys offer a free walking tour several times a week. The Cathedral of St Stanislav and St Vladislav (AKA Vilnius Cathedral) – Undoubtedly one of the most iconic sights of Vilnius, although strangely looking more like a museum than a church 😉 Well worth a stop. Saint Casimir Church – pretty, pink and perfect (though a lot more spectacular on the outside than in). Fun fact: a photo of this church I posted on Instagram inspired one of my followers to bake a pink cake! The Church of Saint Philip and Saint Jacob – a lovely red church that has the most magical bells chiming. Its carillon (a multi-bell instrument) has 61 bells, making it the largest in the Baltics. 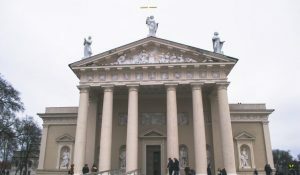 Our Lady of the Sign Church – a little out of the city center, but really beautiful, and right by the river too which makes for a picturesque walk. Subačiaus Gatvės Apžvalgos Aikštelė: Provides an amazing view over the Old Town and Užupis, and with a little cafe nearby so you can enjoy a nice cold bevvie with your view. The Hill of Three Crosses – A local favourite for catching romantic sunsets, and the perfect place to get up close and personal with one of Vilnius’ most important monuments: three gleaming white crosses that stand as a symbol for national identity and resistance to the Soviet occupation. The view from the Cathedral Bell Tower (Vilniaus Katedros Varpinė): A great view, but it loses points for me because of the netting and barriers set up on the upper floor viewing platforms. They make it quite tough to properly enjoy the view (and snap any photos). NOTE: The Gediminas’ Tower is a viewpoint highly recommended by many, but since late 2017 it has been closed for repairs (with no definitive re-opening date just yet). It’s certainly not a pleasant visit, and one that will inevitably leave you feeling miserable, but the Museum of Genocide Victims is a definite must-see, and an eye-opening look into the dark struggles of Lithuania’s past. This museum is housed in the city’s former KGB building, where horrific plans were hatched and executed over 50 years. The visit takes you down to the actual cells of the former KGB prison, an eerie step back in time that presents a real, and unsugarcoated look into the atrocities committed throughout the regime. In the upper floors, detailed displays lead you through the history of the occupation, bringing to life a piece of history that (to me) was never taught in school. A harrowing visit, but a must. In the centre of Cathedral Square is where you’ll find the Stebuklas Miracle tile, which is said to have wish-granting properties. Spin around three times on the tile and wish your heart away – who knows, it might just come true 😉 Still waiting on my proposal from Channing Tatum, but okay. This tile is also significant in that it served as the ending point for the world’s largest ever human chain. On August 23, 1989, in a peaceful display of dissent against the Soviet Union, about two million people across the Baltics joined to create the Baltic Way, known as the longest (unbroken) human chain ever created. Its length? A staggering 370 miles… all culminating to the end point right here at the Stebuklas Miracle Tile. One of the best things to do in Vilnius is (duh) work on padding your waistline through the most sumptuous of local cuisine. 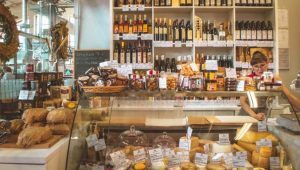 Here are some of the top foodie experiences you need to try when you’re in Vilnius. How can I describe traditional Lithuanian food? It’s definitely not the healthiest of indulgences, but when it tastes this good, one quickly loses the will to count calories. Think of it a gluttonous explosion of carbs, potatoes and meat, all topped with more carbs, potatoes and meat. Imagine what a lumberjack or viking would like to eat after a long day’s work 😉 [Or me, after a long day of toiling away at the keyboard] Honestly: Lithuanian food doesn’t mess around, and your waistline will surely suffer the consequences. 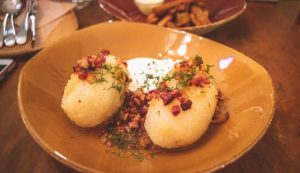 NOTE: Foodies with lighter palettes of course won’t be left to drown in sour cream of course – Vilnius has a wide range of hip, modern restaurants too, offering up cuisine from across the globe. 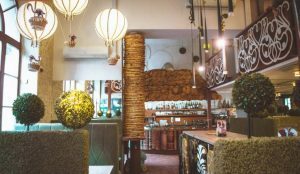 But, because I assume you’re not here to learn about the best place to get a pizza in Vilnius, here are some must try traditional Lithuanian foods to nosh on during your next visit. Bagels – You might not know this, but bagels actually originated from this part of the world, so it’s no wonder Vilnius has a mean bagel scene. We stopped by Beigelistai in Halės Market and tried some of their specialty bagel sandwiches. Mine came stacked out with salmon and capers. I almost died. Get bagels in Vilnius… just do it. Bulvinai Blynai AKA potato pancakes – grated potato shaped into patties and deep fried to golden perfection… all the better when stuffed with fillings or topped with an amazing sauce. I enjoyed an amazing one stuffed with meat at Prie Angelo in Uzupis. It was lifechanging. Šaltibarščiai – a chilled beetroot soup with a Pepto Bismol aesthetic. With its main ingredients being beets, yogurt (or sour cream, or buttermilk), the result is a creamy, refreshing and delicious soup usually topped with dill and hard boiled egg. Super good. Kibinine – Think of it as a Lithuanian pasty, with a delicious crispy pastry cradling some kind of amazing filling (usually something savoury and meaty). We tried a sampling of these from Senoji Kibinine in Trakai. I had the traditional mutton and a dessert one in chocolate. Both were amazing! Halės Market is the oldest market in Vilnius, and today is home to a fascinating mix of both traditional vendors selling the usual (produce, baked goods, etc.) and surprisingly hip and inventive stalls moving in to peddle trendy eats. With Halės Market being just a short walk from our homebase at the Comfort Hotel Rock and Roll, it was a no brainer to start one of our days here while in Vilnius. To get the full experience here, I highly recommend doing a market tour with a guide. Here’s the one we did. We went with a private guide, Alina from Travel Addicts Club and having this “insider” with us really made the experience what it was. With a guide, you get to know all the stories that bring the stalls to life. From the bespoke “smoothie healer” who creates custom concoctions based on the ailments of her clientele to the mother-daughter duo peddling cheese from around the country, you learn that the market is not just a gathering of goods, but of unique people and stories. Of course, none of this would have been possible without Alina! Otherwise I’m sure we would have drowned in awkward language barriers. Pinavija Cafe & Bakery (21, Vilniaus g): A seriously darling cafe that will make all your tea party dreams come true. Think pastel-coloured plates, daintily framed mirrors and even a giant clock with teacups as numbers. The coffee and homemade cakes are amazing too. Gusto Blynine (Aushros Vartu g. 6): Alice in Wonderland themed decor with a menu touting every kind of pancake imaginable. Pretty lukewarm service but the sweets made up for it! Holy Donut (Vokieciu g. 9): A cool and trendy ambiance, complete with giant doughy donuts, an extensive menu of freakshakes and one ridiculously handsome avocado toast. Not exactly the most traditional of settings, but an awesome place to sit a while and fuel up. Cat Café (J. Jasinskio g. 1): A cozy cafe crawling with cats. Depending on what kind of person you are, this might either be a dream come true or your worst nightmare 😉 Choose accordingly. Apparently Vilnius is the cheapest place in Europe to grab a beer, which is reason enough for a visit (in my humble opinion). 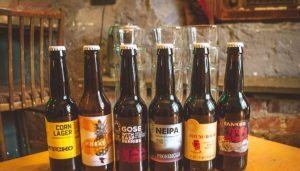 The other is of course that within the walls of this beautiful city, you can find a thriving craft beer scene, packed with microbrewers who aren’t afraid to experiment with new flavours, combinations and techniques. Bambalynė (Stikliu g. 7): This cozy beer cellar is an easy gem to miss, tucked away in a side street, but for those who find it, it offers up over 100 bottled varieties of Lithuanian beer to choose from (DIY style from big fridges on the bottom floor). One of the most appealing parts of this city is of course its irresistible edge. 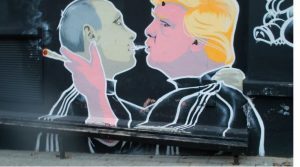 So… if you’re wondering what to do in Vilnius that’s more on the alternative side, here are some options for you. 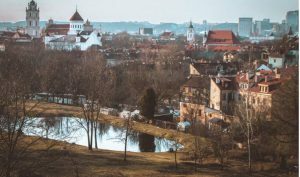 Pssst Travel Addicts Club also offers an alternative tour of Vilnius that spill the beans on all sorts of local secrets. Of course there are a lot of other worthwhile murals in the area. I especially liked the Millo mural at Pylimo g. 56, opposite Halės Market. This little side street is easy to miss if you’re not looking, so mark it on your map! 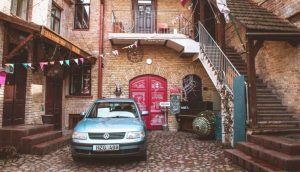 The artsy, bohemian hotspot in Vilnius is known as Užupis, and its outlandishness will no doubt steal your heart. Why? Well, here’s a quick summary: Užupis declared themselves an actual republic on April 1, 1997. Like, an actual republic complete with their own anthem, flag, constitution and currency. Of course, they don’t take themselves too seriously, and while not officially recognized around the world as its own country, Užupis is a prime example of creatives “really going for it”, and that is why I adore it so much. They even a national day (yes, April Fools Day) during which border checkpoints are set up on the bridges. Don’t worry though, the only visa you need is a smile. Seriously. I dare you to not like this place, filled with cute shops, cafes, street art and all sorts of welcoming little streets. Looking to immortalize your visit to this great republic? You can get your very own Užupis passport stamp at Keistoteka book store. Last but not least, I need to give a quick shoutout to our home base during our time in Vilnius – the Comfort Hotel Rock and Roll, filled head to toe with nods to rock music and quirky decor that melted my heart. I loved having this hotel as a base during my stay in Vilnius, because while it was situated just outside of the Old Town, it was close enough to reach all points of interest by foot, and offered up a cool, relaxing vibe to match the unique atmosphere of the city. I highly recommend them! 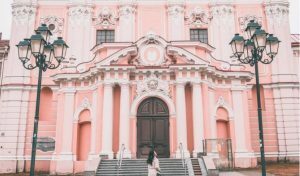 And so, I hope this post filled you up with ample inspiration for amazing things to do in Vilnius!